Description: You are equipped with your standard gun, plus some missiles that you can use to take them down. There are ten levels. The number of missiles you have vary between each level. Furthermore, each level is difficult than the last with more enemy jet fighters that you have to take down. 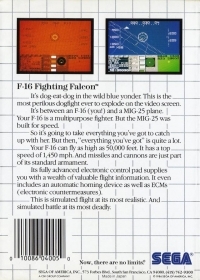 Box Text: In this game, you are flying the F-16 Fighting Falcon, the most advanced jet fighter in the world. In this carefully crafted simulation, your mission is to take down all enemy jets and remain airborne as possible. 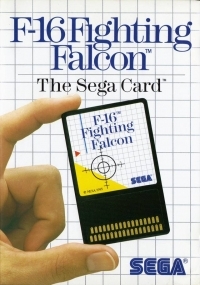 This is a list of VGCollect users who have F-16 Fighting Falcon in their Collection. 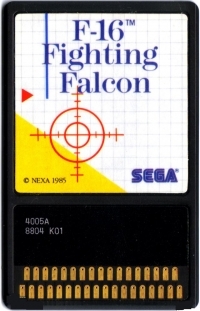 This is a list of VGCollect users who have F-16 Fighting Falcon in their Sell List. This is a list of VGCollect users who have F-16 Fighting Falcon in their Wish List.